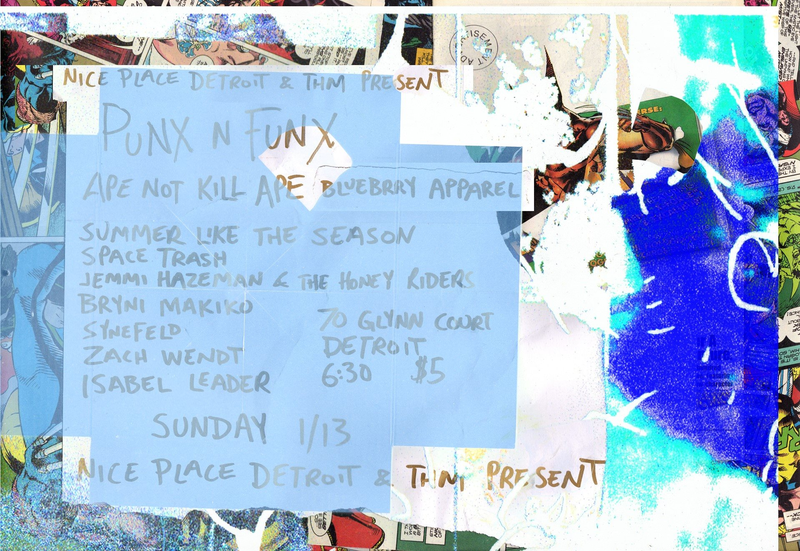 Nice Place will host a bevy of “Punx ‘N Funx” music along with emerging art in Detroit at 6:30 p.m. tonight. Located at 70 Glynn Ct., the Motor City creative workspace will feature the music of Ape Not Kill Ape, Summer Like The Season, Space Trash, Jemmi Hazeman & The Honey Riders and Bryni Makiko as well as pop-up visual art from Jacob Waymaster (aka Synefeld), Zach Wendt, Isabel Leader and Sam Welsing of Blueberry Thrift. For the “Punx” side of music, Ape Not Kill Ape, a Grand Rapids post-punk trio, will perform raw fist-pumping tracks from their 2017 full-length debut, “Bushman.” Adis Kaltak, (vocals, bass), Brett Dame (guitar) and Allen McAllister (drums) will bring an introspective, primal feel to connect with the crowd at Nice Place.